It being just over a year until the next provincial election I fret that people really have no choice. The government is bloody awful and the opposition is scarcely a government in waiting and a lousy opposition to boot – what to do? What about a new party “coming up the middle”, something that pundits always talk about but almost never happens? Well, it happened once in my lifetime, back in 1952, my 21st year. The government, a coalition of Liberals and Conservatives, was appalling, although nothing as bad as Christy’s bunch. The opposition CCF, now NDP, were led by Harold Winch, a highly respected man, their problem being that the right wing had done such a good job of demonizing them that they had a hard time attracting voters outside a select group of supporters. 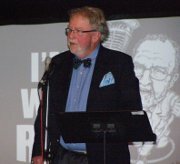 The Coalition split, ran separately and, of course, the CCF ran, but suddenly there was another player in the game, former conservative backbencher William Andrew Cecil Bennett, running for something called Social Credit, which had little presence in British Columbia and no political leader. To the amazement of all, Bennett wound up with 19 seats to 18 for the CCF and after a great deal of tooing and froing by Lieutenant-Governor Clarence Wallace, Bennett, who only became leader after the election, was premier and the Social Credit party became government – for 20 years! I don’t say that it’s 1952 again or, even if similarities are great, that the same thing will happen. It is, I think, both fun and perhaps even helpful to speculate a bit from time to time. If nothing else, it makes for great conversation over a beer or two. I think that three principles prevail – my own, namely, “You don’t have to be a 10 in politics – you can be a 3 if everyone else is 2”; there’s this from former British Prime Minister Harold Wilson: “In politics, six weeks is an eternity”; and then the general proposition that “politics, like nature, abhors a vacuum”. With those thoughts in mind, let’s take a look at the Green Party as the logical third party in the game. One must bear in mind, of course, that there were four parties in the 1952 election, although I don’t think it mattered much, as the Liberals were ill and the Tories terminally so. We have questions: First, is the division in British Columbia such that people are looking for a new option? Secondly, and most importantly, could that alternative be the Green Party, and, if so, under what circumstances? Going on the 1952 experience, if you’d asked that question about The Social Credit League you’d have drawn a blank stare. 2017 is different in this respect – the Green Party does have a presence in British Columbia, in the nation and indeed in the world. It is the same as 1952 in that the Greens have never been close to gaining power. In 1952 there was only one constituency that Social Credit could see as a possibility, Mr. Bennett’s home in Kelowna. 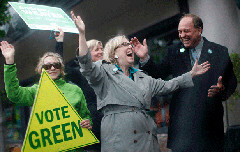 In BC today the prospect for the Greens is better in that Dr. Andrew Weaver, their leader, has a seat and has had a term in the legislature as a Green to get experience and strut his stuff. There are other constituencies, very much including the one I live in, which could easily elect a Green – in fact I find it difficult to think of who else could win in the Howe Sound area. The Liberal MLA has been an appalling failure, having paid no attention to the deep concerns about the potential LNG plant in Squamish. The NDP, who might have a chance under normal circumstances, is a victim of Mr. Horgan’s commitment to LNG and are scarcely seen as friends. The Greens ran a very good campaign in the last federal election but were victimized by strategic voting by a public that wanted to be rid of John Weston more than they cared about who they elected. That will not be the case in 2017. Are there other constituencies similar to mine? I suspect the Cowichan area would be fruitful given the government’s support of an LNG plant at Bamberton in Saanich Inlet. There may be others. It’s probably true to say that most ridings have a fairly prominent environmentalist in their midst so that whatever candidate the Greens choose will be reasonably well known, a matter of great importance. What’s unknown is the leadership ability of Dr. Andrew Weaver. Does Weaver have the right stuff? I don’t know Dr. Weaver but what I have heard is all good – except that he supported the Liberals’ horrendous private river power program back in the 2009 election. He is not well known in the province, is not seen as a particularly charismatic individual but is very well-informed, capable, and sincere. But can those qualities be translated into a winning leader for a party that until now has been a “no-hoper”. Here is my proposal: If Elizabeth May was the leader of the BC Green party, I think it would be in there with a chance not just for opposition but who knows, a repeat of 1952? This isn’t a knock on Dr. Weaver. He has a done an excellent job. Elizabeth May, however, is a one-off, having had considerable electoral experience becoming extremely popular right across the country. She won an enormous victory in her own riding against the Trudeau sweep and is, if my riding is any example, very popular with the grass roots. She has that mysterious charisma as all who have met and heard her will attest. It also helps that she is extremely well-informed on all major issues. As I understand it, the Green Party’s federal and provincial wings are separate so if Ms. May were to lead the BC wing, it would require 100% cooperation from Dr. Weaver. Having a been a politician I know that Dr. Weaver is not likely to be thrilled at the idea of standing aside for Elizabeth May or anybody else. He doesn’t have enemies in the party that I know of and no one wants to see him turfed out. Weaver’s consideration is that if May can make substantial inroads into the Canadian political situation by a strong performance in BC, the Greens as a whole suddenly gain legitimacy. I don’t believe that the Green Party can do well nationally until the voting system changes to proportional representation and God only knows when or if that will ever happen – UNLESS, it demonstrates that it could win in a Canadian province. That would have to be the reason that Dr. Weaver would consider any sacrifice. Being a reasonable man at heart, I don’t think that Dr. Weaver is going to step aside, nor do I think that Ms. May wants to be the leader of the BC party. That doesn’t mean that Dr. Weaver should not step aside nor that Ms. May should not come to BC – they would have to put the Party first – just that I don’t think it’s going to happen. That being so, I don’t think the Greens can capitalize sufficiently on the horror story that exists in Victoria. My opinion is very different if Elizabeth May is leader because what voters are looking for more than just getting rid of the incompetent Clark government is leadership, something pitifully lacking in Christy Clark and John Horgan and a quality they’ve had every opportunity to see in Elizabeth May. I leave my prediction like this – with Dr. Weaver as the leader, fine man that he is, the Green Party has two chances: slim and none. With Elizabeth May as leader, they’re in with a helluva good chance. There was another BC 3rd party that came extremely close to taking power away from the ruling NDP and Liberals… Gordon Wilson’s PDA party. If he hadn’t folded in with the NDP he would’ve been there to become a PDA Premier once the NDP self-destructed, while the Libs & Socreds were still on tender-hooks. The Greens will require a similar self-implosion by the Liberals as the NDP flounders on policy issues. We could see a whole new block of voters this time around, which could have a substantial impact on the next election, be it in May or sooner. Mr. Trudeau has made them pay attention and frankly even a little attention is acres beyond anything they exhibited in the past. I believe large chunks of these youngsters have woken up to some of the shenanigans in Victoria. Not all but enough to make them stop and think. They are as yet uninformed on Site C, BC Hydro and IPPs but are stoked over the whole LNG snake oil and see it for what it is. Raised right here on the coast, my sons have taken a healthy interest in Howe Sound and the Saanich Inlet. Those two items alone are enough to get them solidly behind the Greens if presented with a solid viable slate of candidates. The generations below me are serious about change and are ripe for the picking. You maybe on to something there. some one other than the B.C. Lieberals need to win the next election and it doesn’t appear the NDP is up to the task. The B.C. Green party could start nominating all their candidates now and get them out into their communities. They can win but they have to be prepared to do the work. Last time the NDP used an Eastern firm to run their election. We know how that turned out. Notley in Alberta hired, B.C.er, Gerry Scott, and with an Albertan change in mood and him, she won. The B.C. NDP is largely missing in action. True, the MSM doesn’t give them much coverage, but there are alternative methods of communication, including community newspapers. Many of those are owned by Black Press, but they have printed enough of my anti B.C. Lieberal and anti harper letters to the editor, to give me the impression, they will print letters which they may not agree with, as long as they provide valid information. The BCNDP simply haven’t even found a subject to make them stand out. Their M.L.A.s all seem to be missing in action with the exception of Horgan as party leader and Eby. What the NDP needs is a whole lot of Eby’s–young, as in under 40, energetic people who are out there in the community. Like how many of the NDP MLAs were up at Site C? we know people don’t like child poverty; government imposed poverty on seniors and the disabled; not having family doctors and they’re about 1/2 million of us; lack of public education funding. Just those topics ought to get a party elected. if you then go for the Site C, pollution, destruction of environment you got it made. The B.C. Lieberals are already advertising as are their good friends in the LNG movement. where are the NDP and their ads? I understand they cost money, but really I’ve seen how the American Democrats fund raise and the NDP might want to consider hiring a few of their people. The NDP does not appear to have even capitalized on the B.C. Nurses Union ads. Just for the record, I was raised in an NDP environment, have belonged to the party and worked for it in elections. I know in my own family, in spite of my best efforts, there was a total lack of interest until Justin came long. Raised right here on the coast, my sons have taken a healthy interest in Howe Sound and the Saanich Inlet. Those two items alone are enough to get them solidly behind the Greens if presented with a solid viable slate of candidates.The NDP simply can’t get it together to pick a subject. All MLAs receive $12K a yr as a housing allowance. no receipts required. With the high rate of child poverty in this province, the low welfare rates for children and the disabled, they could have gotten 2 years worth of advertising out of their MLAs turning back those cheques.